Bay burst onto the action movie scene with 1995’s buddy cop flick, Bad Boys, and proceeded to make a bonafide classic with The Rock a year later. In 1998, he threatened to destroy the whole world with Armageddon, which is at the same time one of the dumbest yet most watchable action movies ever, that guarantees everyone will cry at the end, every time. After those three films, Bay went back to a day that lives in infamy, December 7th, 1941. And to his credit, his depiction of the Pearl Harbor attack by the Japanese is a fairly epic piece of moviemaking. Unfortunately, there are two hours surrounding the attack that are some poorly mashed together lovechild of Ben Affleck’s Armageddon scenes with Liv Tyler, and cutting room floor Titanic footage. Narrator Jon Bailey gives credit where it’s due (although enjoying that scene makes you kinda sorta un-American), but goes right after Bay for essentially ripping off the entire plot of James Cameron’s 1997 record breaking Titanic; as in take a 100% true and movie-worthy historical event, and add in a completely fabricated love story. So watch as two pilots with terrible southern accents (Affleck and Josh Hartnett) both fall in love with Kate Beckinsale, and then single handedly defeat the Japanese! The movie is so obviously trying really hard to win Oscars, but is so stereotypically derivative, that all the women are naughty nurses, and all the men make you wanna yell “’MURICA!” Oh, and it did win an Oscar… for sound design. 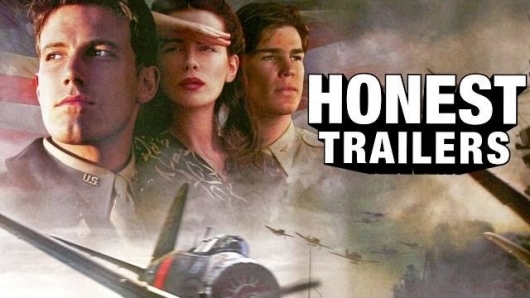 Starring: A Daredevil Pilot, Black Hawk Dumb, Kate Beckons Sailors (Haha, that’s great), and NOT starring anyone who was actually in or near Pearl Harbor! (Bailey goes on to show some real war heroes with much better stories than the lame characters in the film. New title: Bore-A! Bore-A! Bore-A! Screen Junkies have over 5.1 million subscribers on YouTube and releases a new Honest Trailer every Tuesday. Experience Pearl Harbor, the Michael Bay fan-fiction version of history that cashes in on yet another American tragedy.